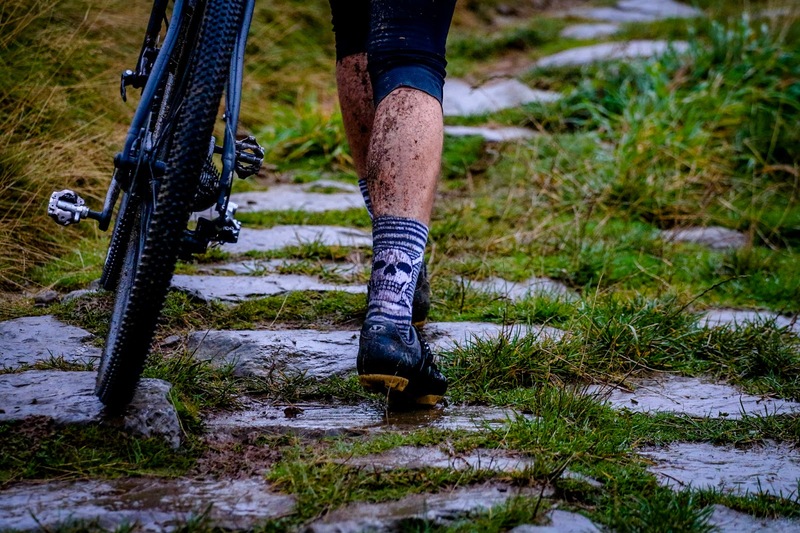 The Pennines were in characteristically brusque mood on the 7th October, unwilling to give up their finest views to the riders who’d travelled from far and wide to pit themselves against the rugged gritstone of the southern Pennines. Low cloud laden with fine Atlantic rain soaked all who were brave enough to take on the elements. This was looking like a 'type 2 fun' kind of day, one to feel good about later in the pub, or reclined on the sofa in front of deadeye. 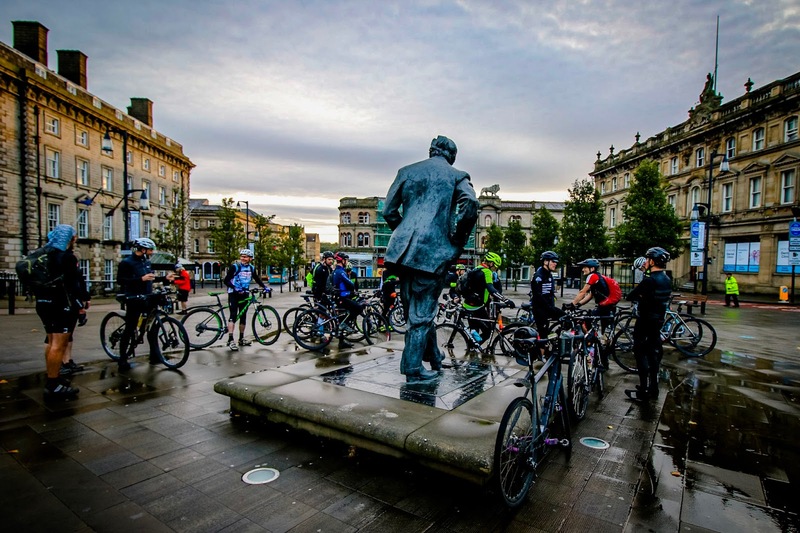 It was good to see a bunch of riders including some familiar faces already assembled down at St Georges Square as I rolled in at 7.30am. Some sat astride gravel bikes but quite a few were on mountain bikes, these fat tyre riders were mainly locals who knew the terrain and had opted for comfort and puncture avoidance. As the hands of the station clock eased past 8 I thanked those assembled for turning out and offered some route advice. A couple of photos later (thanks to Stephen Smith for these) and we free-wheeled off past the outdoor market, across the ringroad and onto the canal towpath. I led the riders westward out of town, occasionally glancing over my shoulder to see a string of riders stretched out along the canal path behind me. Marsden was the start of the first Strava timed segment (#XDP-1). I pulled over and let the riders get on with the segment, I wanted to sit back and watch today as they climbed towards the cloud. 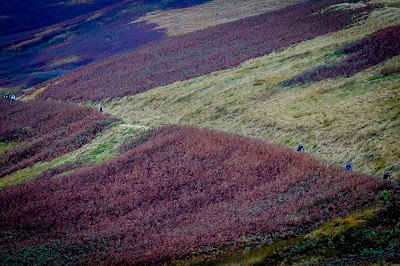 Wessenden Head was cloaked in mist, moorland grass heavy with fat droplets of water and the dying bracken adding a melancholic shade of rust to the view up the valley. The old cart track down to Digley reservoir had many cursing the old stone slabs which were grooved deep from the thousands of iron shod cart wheels which had rolled this way in centuries past. The descent also claimed the day’s first victim, a rear mech terminally twisted out of shape. A trail-side singlespeed conversion got the bike mobile but that rider was homeward bound. The summit of Holme Moss was wild, heavy mist from the west soaked us whilst the wind grabbed wheels and pushed unwary riders toward the roadside ditches. This was no place to hang around and we soon dived down toward Longdendale playing a high stakes game of ‘who’s going to touch their brake first’, you can hit 60mph down here on a calm day. I was now riding with a couple of local riders; Mick Collins and Pete Horne - both on mountain bikes and both well used to this terrain and weather. Pete will celebrate his 70th birthday next year and yet is not afraid of a a fast rocky descent or a slippery technical climb. An inspiration to all of us and a reminder that if age is your excuse, you need to find a better one. After the rocky and occasionally technical track of the Pennine Bridleway came Chew Valley Reservoir climb, a traffic free but tough and pointless climb to a dead end atop the Pennines. This was another wild summit and few hung around, most eager to return to the comparative calm of the valley bottom. We rode on towards Diggle on narrow roads and ancient tracks. In Delph Pete opted to carry on whilst Mick and I stopped for lunch and a coffee break in the back room of a cafe in Delph. After making up time on the road from Delph we turned left to follow the now familiar Pennine bridleway signs. This time we were bound for Hollingworth Lake, once more on old packhorse trails. I was glad of some suspension on the descents, Mick and I flew past riders on gravel bikes, impervious to the drainage channels and rocks lining the trail, focused only on getting down as fast as we could without puncturing. A shove up a steep rubble strewn chute and we were on our bikes again, contorted in the search for rear wheel traction on the saturated grassy climb that followed. 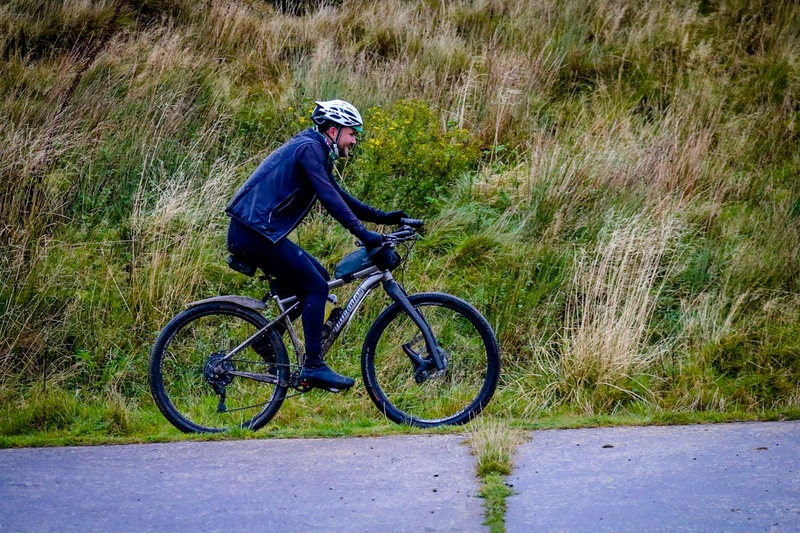 Mick’s relief at completing the climb was tempered by the realisation that his freewheel was going bad, only engaging every few turns of his cranks. He nursed his Van Nicholas down to Hollingworth Lake where we decided to see whether together we could get him back home to Sowerby Bridge 10 miles away. An occasional shove from me and some frantic spinning from Mick saw him home within an hour. 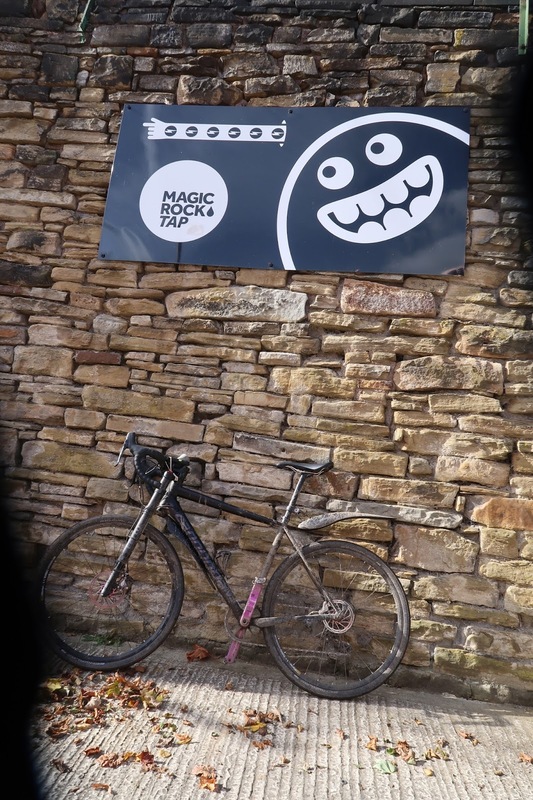 I was now some way off route and it was late afternoon, I needed to get to the finish at the Magic Rock Brewery Tap. I met up with a few finishers down at the Magic Rock who agreed; it had been tough but they'd enjoyed the challenges of the route. 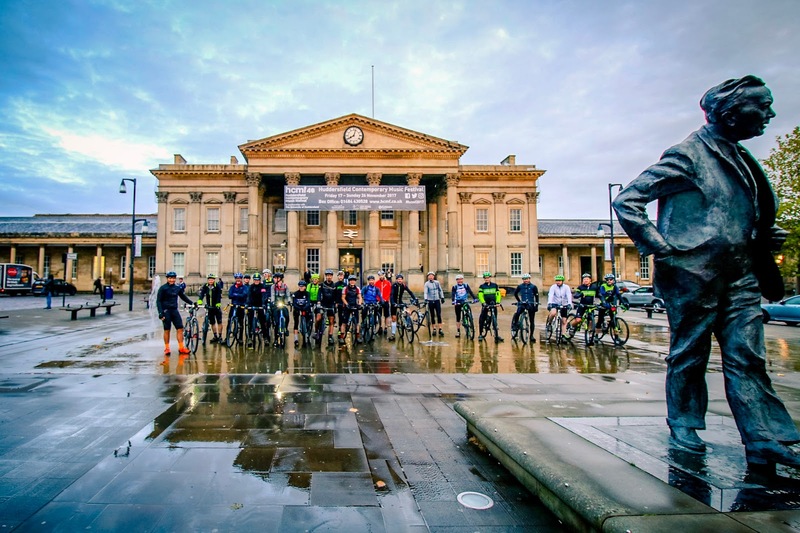 Some riders had retired around the 50 mile mark and a few had suffered mechanical problems but plenty had completed despite the challenging conditions. It had been a pleasure to share some local trails with riders from further afield, one which I hope to repeat next year.